Get the best out of our edddison platform. Nowadays it is necessary to use multiple interfaces to produce and navigate interactive 3D apps. Every application has to be separately prepared and requires special plug-ins. edddison is not software, it´s a unique platform, which combines standard 3D software with input devices in one system, allowing the creation of impressive applications. It is a collection of different programs and interface technologies. It works within a split screen mode, which means that the hardware interface is separated from the display showing the 3D scene, making navigation easier. The continuous access to a floor plan warranties that youll never get lost in virtual space. 1: The edddison editor, that is a graphical programming environment to design and create real-time 3D applications. 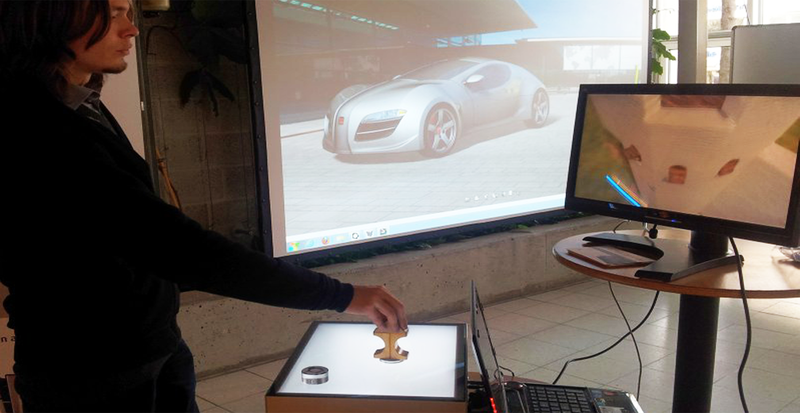 2: Hardware interface to interact, navigate and control 3D files. 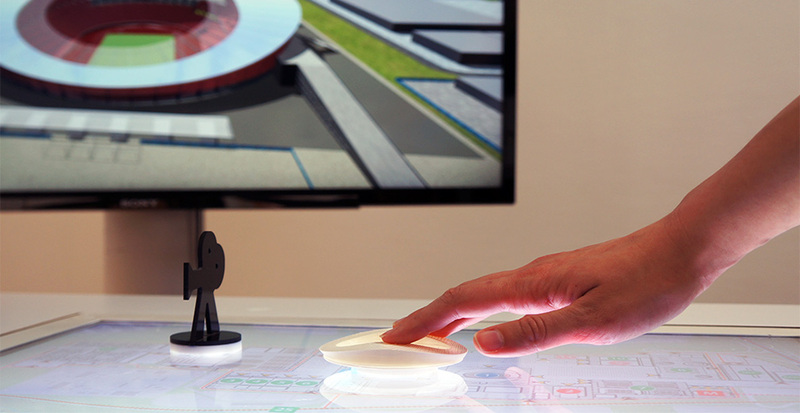 Currently, edddison supports tangible objects detected by cameras, touchscreens and tablets. 3: Plug-in for standard 3D software. Currently, edddison supports Trimble SketchUp, Autodesk Showcase, Autodesk Navisworks and Unity 3D. Why is the interface separated from the 3D view on the monitor? The control device simply helps you to navigate, nothing more. The more important view is the 3D software. Thats the whole point. Why use a floor plan for orientation? The control device uses a floor plan for perfect orientation through the 3D data, allowing you to always keep your bearings in spatial environments. This solution provides better recognition between 2D (plan) and 3D (view) information. Why invent new 3D software? Millions of users cant be wrong, so we rely on proven, widely used 3D software. We are currently developing edddison plug-ins for software such as Autodesk Schowcase, Autodesk Navisworks, Trimble SketchUp and Unity3D. So its possible to navigate your 3D data made within your favorite software. What is the MRI technology?